The 2010 Knight News Challenge winners were announced last week at the Future of News and Civic Media Conference, held at MIT. The John S. and James L. Knight Foundation selected 12 winners from nearly 2,500 entries from across the world and awarded them grants totaling $2.74 million. Local Wiki – Philip Neustrom and Mike Ivanov of DavisWiki.org received a $350,000 grant to create enhanced tools for local wikis. Wiki websites use software that allow easy creation and editing of pages, often for collaborative efforts, such as WikiPedia. Neustrom and Ivanov hope to encourage local communities to maintain their own wikis. WindyCitizen’s Real Time Ads — Brad Flora received a $250,000 grant to develop a software interface for real-time ads that will show the most recent message from the advertiser’s social networking profile of choice. One-Eight — Teru Kuwayama received a $202,000 grant to develop a project that chronicles U.S. military operations in Afghanistan through the experiences of one batallion. Stroome — Nonny de la Peña and Tom Grasty received a $200,000 grant to create a virtual studio that would eliminate the need for video editors to rely on expensive satellite truck technology. It’s an effort to create a new form of local media around mass collaboration. When we think about local blogs and how successful they’ve become and how common they are, and when we think about local media and what the future form of that might be, it might make a sense to picture a way where everyone in the community can contribute to one cohesive unified thing. Neustrom also said that one of the biggest obstacles to the growth of such an idea has been the learning curve of working with current wiki software. He and his partner Ivanov want to simplify that software. Local Wiki also involves plans to include map technology, which is also a component of several other New Challenge winners’ projects. 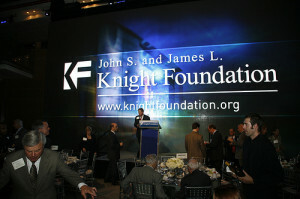 The Knight Foundation has been awarding these grants since 2007. We wrote about the progress of a winning idea from 2008, the Sochi Olympics Project, a few months ago on the SixEstate blog. Another site we’ve covered here before, whistleblower website WikiLeaks, submitted a proposal for the New Challenge but was rejected. Marc Fest, a spokesman for the Knight Foundation, wouldn’t comment on rejected proposals but when asked specifically about WikiLeaks, he had pointed to the three rules listed above. Applications for the fifth and final year of the News Challenge grants will open in the Fall. Image by The Knight Foundation, used under its Creative Commons license.